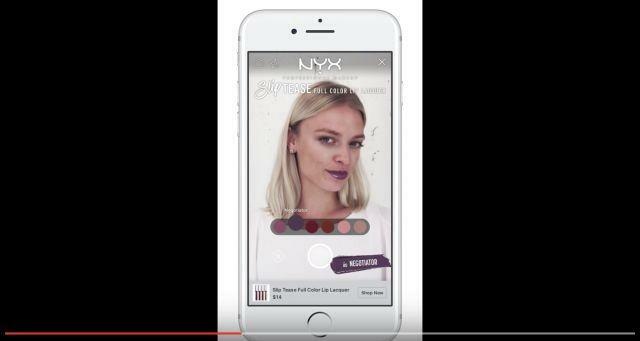 Screenshot of the YouTube video: "NYX Professional Makeup - Facebook AR Experience Demonstration"
L'Oréal is teaming up with Facebook to bring augmented reality makeup experiences to the masses. The global cosmetics giant is joining forces with the social media platform via ModiFace, the AR company that it acquired earlier this year. Modiface will offer Facebook users the chance to virtually try on a range of makeup products from some of L'Oréal's best-known brands, including Maybelline, L'Oréal Paris, NYX Professional Makeup, Lancôme, Giorgio Armani, Yves Saint Laurent, Urban Decay, and Shu Uemura. The project will kick off at the end of this month with an NYX experience. "We are at that magical moment when technologies have matured enough and consumer appetite for using them is growing everywhere," said Lubomira Rochet, L'Oréal Chief Digital Officer, in a statement. "We are very excited about that new step in our long-term partnership with Facebook." "By bringing AR into the mainstream L'Oréal and Modiface are reshaping the beauty experience and we're thrilled to see this brought to life on Facebook," added Will Platt-Higgins, VP of Global Account Partnerships at Facebook. Augmented reality and virtual reality technologies have becoming a major focus within the beauty industry over the past year, with brands such as Tarte, Charlotte Tilbury and Lancôme just some of the brands to have explored offering customers various immersive virtual experiences or online tutorials.